It’s about ten in the morning when we leave our hotel in the center of Harbin and we quickly hurry towards the closest bus stop looking for bus number 338 which, according to the tourist map taken from a hotel near the station the night before should bring us to the Unit 731 Museum. “If we’re lucky it will pass right by here” – I think – while little by little along with my wife Yan, we cross the street and check an information board that immediately dashes my hopes. We look around for someone who can give us directions and the most trustworthy person we find seems to be a young man with headphones and an iPhone who I presume was listening to music. I go up to him and in my broken Chinese I ask if he knows the closest stop on our bus route. He doesn’t know but is very helpful, and after a quick check on his cell phone he completely ignores me and gives my wife directions. “Great!” – I think while we walk in the way we were directed. But in China things are often never the way you imagine them and in fact, after several requests for information and route changes, numerous and extremely dangerous “highway” crossings (in the first place because the roads are so wide that any Italian Highway in comparison could be used by kids as a track for their little cars, and secondly because the pedestrians are considered on par with a gnat) between zooming cars, buses, trucks, motorbikes and bicycles, going against wagons, carts and an absurd continuous roar of car horns, 30 minutes had already passed and there was no shade at the bus stop. At a certain point I realize that we are looking for the bus station and not a stop on the 338 and I then realize that I didn’t understand earlier (in view of my level of Chinese) or that my wife had changed our plans on her own and didn’t think to let me know. After about 45 minutes we reach the station and we begin to check all the bus stops but don’t find what we’re looking for, we ask around and they recommend that we take a taxi. But that doesn’t work for us. Finally, an elderly man sitting nearby in a language incomprehensible to us, indicates a direction. We follow it and finally glimpse from far off bus 338. We go up to it, Yan asks the driver how much a ride will be and this guy, without raising his eyes from his phone babbles something, so we get on and my wife hands over 2 Yuan and we take seats at the back of the bus. It’s now about 11:05 and those initial twenty minutes have tripled. From the bus station (which in the end is very close to the train station) to the district of Pingfang where the operating base arose for Unit 731 and where today the museum is located (inside the base and built on the ruins of one of the original buildings) takes about an hour. During the trip I noticed something unusual: after the first stops in which passengers get on at the rear door of the bus and exit through the middle door, at a certain point the process was inverted (they got on at the middle one and got off at the rear) and I also notice that those that get on sit down without paying. She will be right… “it’s impossible”, I saw it with my own eyes but I didn’t reply. The Shuang Yong Lu stop (双拥路) is the one for the museum, the exit is still to the rear, we pass down the aisle and with a little leap I’m outside. I hear the driver yell, I turn to see what his problem is but I don’t understand a word. Yan, still on the bus, tells me that we need to pay for a ticket and takes out 2 Yuan from her wallet. The driver keeps shouting and I continue to vehemently protest while my companion puts money in the “toll box” and gets off. I look at her nervously while the bus leaves and ask her why, and she tells me that the driver had mentioned something to that effect when we got on but she didn’t pay much attention to it. I’m still upset but don’t want to ruin the day over 2 Yuan so I let it go and hand in hand we head to the museum. It isn’t far, just turn the corner and continue for about a hundred meters. A modern building finished in 2015 by the famous Chinese architect He Jing Tang (何镜堂) greets our eyes. Entry is free, I can take all the pictures I want but I have to throw away the small bottle of water I’m carrying in my backpack. In September of 1931 Japan invaded Manchuria, and the following year it created the puppet government of Manciukuo under the formal guidance of Emperor Pu Yi. In 1936 Unit 731 is born, near Harbin, placed under the command of microbiologist and medical officer of the Japanese army Ishii Shiro, a strong supporter of the advantages chemical-bacteriological warfare could bring to the Japanese Empire that was short on resources but rich in ambition. In July 1937 Japan invaded China, starting the second Sino-Japanese war which coincided with the beginning of the Second World War in the Pacific. 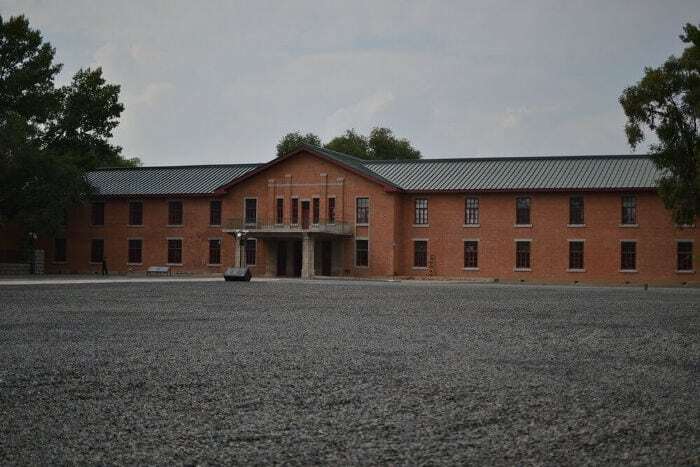 In 1939 the Unit 731 base was transferred to the Pingfang district, where the museum now stands, and it will be more or less destroyed in 1945, before Japan’s unconditional surrender that brought the Second World War to a close, for the purpose of hiding the evidence of the crimes commited within. Unit 731 dealt with experiments on plants, animals and human beings. The atrocities perpetrated in Unit 731 and the damage to civilians and prisoners of war are unspeakable and could even make the Nazis at Auschwitz turn pale! Manchuria teemed with “cheap” human material: the Chinese were considered an inferior race and were worth next to nothing. They were called “maruta” which means “wooden stumps” (it seems that the origin of this term is due to the fact that the base was officially listed as a sawmill), identified by three digit numbers and used as guinea pigs for the most numerous and unlikely experiments. Women and men, young and old, children, pregnant women, mainly of Chinese origin but to a lesser extent also Koreans, Mongolians, Russians, English and Americans, were objects (in the most truest sense of the word) of experimentation in Unit 731: vivisection without anesthesia (because anesthetics could alter the results), experiments of freezing and thawing, exposure to high sources of heat, amputation, excision of organs, asphyxia, drowning, food and water deprivation, infection with pathogenic agents (cholera, anthrax, dysentery, botulism, typhoid, tetanus, salmonella, tularemia, pests and lots more), compression and the list sadly goes on and on. Open field experiments with unlucky ones tied to poles and bombed with chemical and bacteriological weapons to test the effects of the weapons studied in the laboratories. 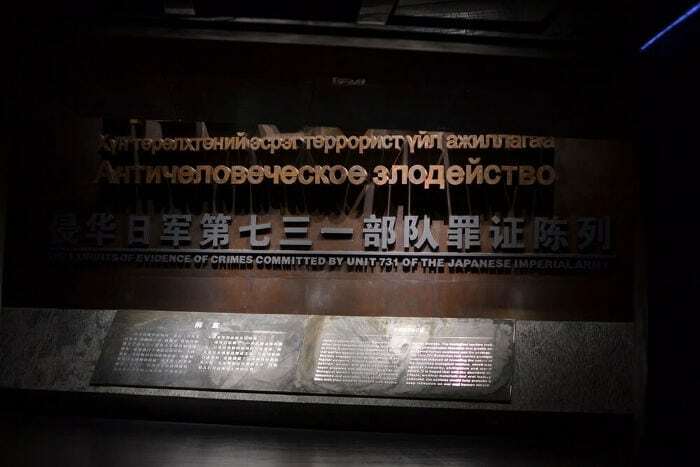 In several cases, Unit 731 brought about biological attacks against civilian villages poisoning the crops, water, food or freeing infected animals to bring pain and death. The museum recounts all these horrors! Following a path that goes through three large areas and divides into different exhibition stands, you are immersed in images, films, reconstructed scenes, accounts, documents, testimony, regrets, official reports, bulletins, notes, daily objectives, syringes, containers, gas masks, all presented in an original, modern and extremely engaging way. Every report, every story, every document is presented in Chinese and English. It is not a “normal” museum where you can walk through distractedly paying more or less attention to the objects on display, but rather a museum that moves you to read, listen and deepen your understanding. It is a museum that forces you to think of the horrors that the human mind is capable of, horrors that were studied at a desk to satisfy feelings of superiority and power, or perhaps, just to appease pseudo-scientific curiosity. There aren’t any particular instruments of torture but everyday tools of an analysis laboratory that in the hands of experimenters was transformed into cruel and gruesome instruments of suffering. You would think that with Japan losing the war, these murderous criminals would have received just punishment, but you learn that in 1947, Shiro Ishii and other members of Unit 731 were granted immunity by the USA in exchange for the results of their research and that only 12 criminals associated with Unit 731 were tried and condemned in 1949 in Khabarovsk (Soviet Union). Before leaving the museum you can leave a dedication on the electronic boards or buy books and gadgets in the shop across the way. After exiting you can visit the offices of the Japanese staff (which are well preserved) and take a tour of some ruins that are still standing. Three and a half hours have passed since we got to Pingfang and we have to head back because at 17:26 we need to catch a train for Changchun. We’re tired, hungry and thirsty but it’s too late to stop for something and we hurry our pass toward the bus stop for the 338 that will bring us back to the station. Getting on the bus my wife asks the driver for instructions about costs and payment and receives confirmation that it costs 1 Yuan a person both when you get on and when you get off the bus. Already after a few stops things don’t change and various people get on and off the bus without paying anything, and once again after a few stops the entrance and exit inverts. The next stop three girls and three men get on: one of the three men is tall, burly, imposing and sits right next to me, the other two make themselves comfortable in seats like ours while the girls are just a little more forward. We look at each other incredulously but I think I understand, and just at that instant where I turn to my wife to tell her what I think, she turns to the group to ask for clarification. This sparks a nice little chat among the five and just me and the guy next to me don’t participate, which supports my intuition: you essentially pay per kilometer through the exchange between the entry and exit doors of the bus. In practice, at intermediary stops you leave from the middle door and pay only when you leave from the rear, instead, at the farther stops you get on at the rear door and pay the first time and then pay or not the second time depending on the door that opens at your particular stop. It’s an ingenious system but not easily understood by a tourist. Obviously it’s a short step between paying the tolls and questioning the “laowai”, which I’d say is almost obligatory. “Zhuhai” my wife responds and the “interrogation” suffers a setback because now they need to figure out where Zhuhai is. “In Guangdong” my wife continues. “ah… Shenzhen” says one of the two men to my left, “Guangzhou” says the other. But they’re not sure and so turning to them I decided to intervene: “Cong Guangzhou dao Zhuhai chabuduo 150 gongli… ah” (from Guangzhou to Zhuhai is about 150 km) and that final “ah” betrays my Cantonese origins. Their expression changes and the man closest to me moves to the chair right behind me and with a smile somewhere between stupid and amused asks me: “Ni hui jiang zhong guo hua ma?” (can you speak Chinese? ), “Yi dian dian” (a little) I respond and sit back in my seat. At this juncture, the giant sitting in front of me turns around and without saying anything stares at me from behind mirrored “Ray-Ban” style sunglasses. I stare back from behind my own sunglasses but it’s no use, for him it’s easier and he easily wins because I’m distracted by the noise of a cell phone camera. It’s the guy behind me who took a picture but didn’t like it so he puts his arm around my neck, puts his head close to mine, stretches his hand with the cell phone and takes another shot but this too isn’t to his liking. I then decide to cooperate (since I can’t do anything else) and I take his phone to snap a picture, we embrace, smile and… click. Fortunately this time he liked it; we exchange QQ numbers and swear eternal friendship. We are at the start of the line and our train for Changchun leaves in about 55 minutes but we absolutely have to eat something (which shouldn’t be a problem since in China you can eat at any hour of the night or day). We go into a first restaurant but my wife doesn’t like it, says it’s dirty (really I just think she didn’t like the menu), we go into a second and the cook had left, we go into a third and they have “hei mi zhou” (黑米粥, literally black rice porridge), we take two, rather no… just one, I changed my mind (while pouring it into the bowl the waiter sticks his thumb into it and I lose my desire to eat it, but when I tell my wife this she looks at me like I’m an alien). The night before I saw a place near the station where you can get “chao mian” (noodles) so I console myself with the thought that soon I’ll have something in my stomach. “You should eat,” the owner says to my wife – “he’s too thin…”, she translates for me and I thank him but tell him not to worry because I’d eat that evening. He looks at me the way you look at a “laowai” that doesn’t eat even though he’s starving. Finally we leave the shop with 20 minutes until departure and we have to be quick. I rush into the restaurant and randomly choose a noodle dish: “yi ge chao mian… ah”. Service is immediate, I eagerly slurp down three quarters of the plate and we run to the station with our hearts in our throat, the urgent need to use the bathroom and … we can’t find the tickets! Loving husband, inveterate traveler, avid cook, amateur pizzaiolo and photographer, failed trader. From Salento to Guangdong because the important is to stay in the South! Thank you for the wonderful yet humorous post. I thoroughly enjoyed reading it. Me and a few friends will be visiting Harbin in the next 2 weeks and one of the museum that I wanted to visit will be Unit 731. I would be grateful if you could provide me some answers to the following questions as I intended to take the bus as well. I speak minimal Mandarin and am worried we’ll get lost. 1. Is the bus station located in Harbin Railway Station? 2. We will have to pay 1 yuan per person during boarding and another 1 yuan upon alighting, correct? Appreciate your help and Happy New Year to you and Yan! Need help for organizing your trip to Asia?